The Framework program can be setup in the Dutch, English, German and Croatian language. 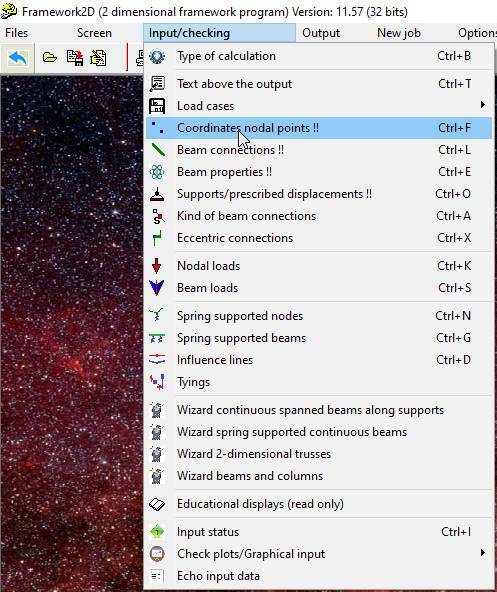 This program can be used to calculate the statical force distribution and Eigenfrequencies in a 2 and 3 dimensional frame structure. The program does try to combine a high degree of user comfort with rather advanced calculation techniques. The program allows metaphorically speaking peeling off skin for skin. At each skin layer peeled the substantive difficulty increases, but the program operates at every level of peeling. For a novice user to the program it’s strongly recommended to start with the two-dimensional part of the program. The principle of the onion implies that the program makes use of multiple windows which are successively opened by the user; each onion ring is, as it were, a separate window which is opened as a descendant of a previously opened window. distribution and Eigenfrequencies in a 2 dimensional framework. distribution in a 3 dimensional framework. beam load, all types of loads are processed at an exact analytical way. loads and the NODAL loads acting on the framework. deformations and beam forces near the nodes. 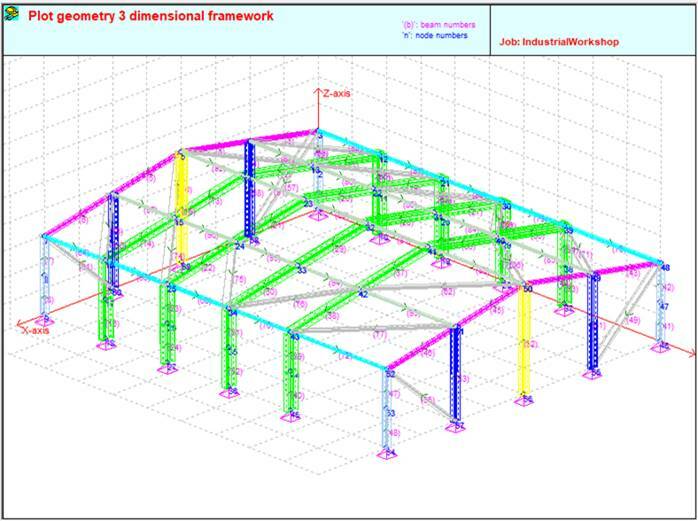 the whole framework, separated per beam or per combination beam. Also by clicking at the tabs the calculated stresses can be shown. a number of BASE loads or load COMBINATIONS can be calculated and pictured. The deformations of the framework can be plot as nodal displacements. does not longer holds. 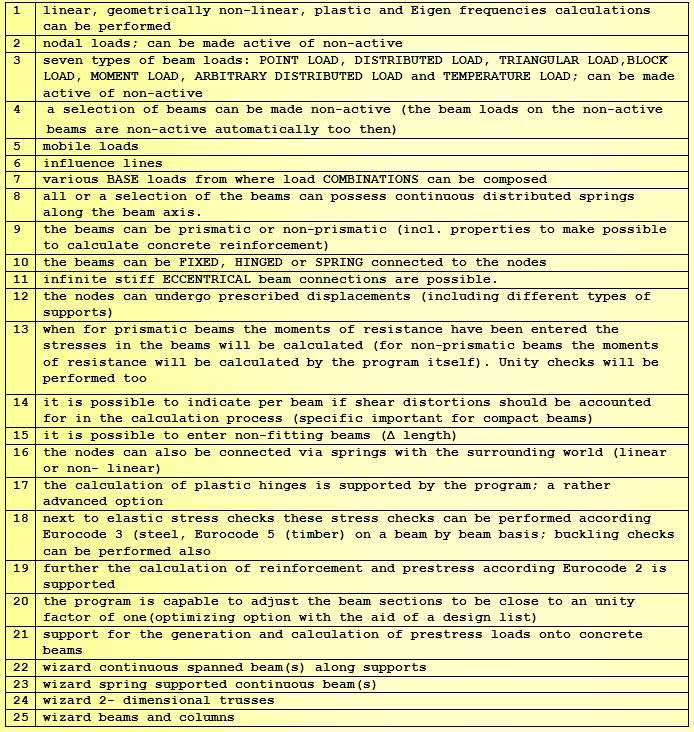 Each base load case and load combination is calculated apart therefore. of all Eigenvectors (Fourier analysis). large (and also the stresses). The lowest Eigenfrequency is most critical. (the first Eigenmodes) are of importance. about 10 Hz; the frequency of wind loads on buildings lies at about 0.1 Hz. materials this effect can be ignored. dummy nodes which should be input extra. The calculated Eigenvectors are normalized at a maximum value of "1". only the shape of the vibration is calculated. (mass and moment of inertion). calculated of normal forces, shear forces and moments. Except of numerical output (also stresses) a graphical reproduction is possible. The 3D capabilities are equal to the 2D capabilities for the calculation of Eigenfrequencies. The calculation or Eigenfrequencies is part of the supported earthquake multi modal response analysis (according to EN 1998-1); see further Earthquake load 3D. The program does support the “General method” for lateral and lateral torsional buckling according Eurocode 3 (EN 1993-1-1; art. 6.3.4).